Is there a cavity vaccine? 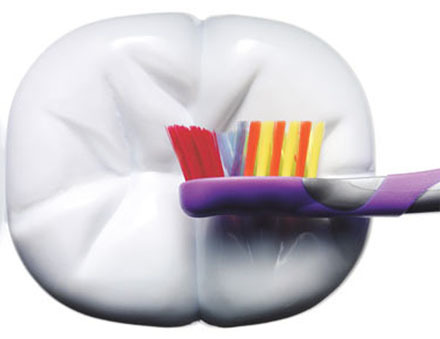 Most of us are used to waging a lifelong battle against the bacteria that colonize our teeth and cause cavities. These pain-inducing chasms are the most common childhood disease in the United States, with 98 percent of adults aged 40-44 having suffered some sort of infection related to cavity-causing bacteria in their lifetime. We regularly deploy dental floss, shots of antiseptic mouthwash, and stuttering electric toothbrushes to hold the bacterial swarm at bay. But scientists are working on our greatest weapon yet: a vaccine that would prevent the most common strain of cavity-causing bacteria from gaining a foothold in the first place. Both British and American researchers have developed a variety of vaccine approaches over the years – going as far back as a 1969 experiment on monkeys – but almost all of the methods attack the same strain of bacteria in our mouths. Known as Streptococcus mutans, the bacteria strain thrives on the sugars found in the staple foods of our diets, like the fructose found in fruits or glucose, which is found in sweets. In the process of feeding and multiplying, the bacteria not only form a biofilm of yellow plaque, they also produce organic acid byproducts that eat into our teeth and eventually may cause cavities. A vaccine would contain antigen molecules which, when injected, stimulate the body to attack the cavity-causing, plaque-forming bacteria. Depending on the specific vaccine, the immune system’s antibodies can prevent the bacteria from attaching to teeth, breaking down sugars to produce acid, or reproducing itself. Despite the fact that work on a vaccine dates back to the 1960s, safety clinical trials did not begin until the nineties, according to a review article in the July 2006 issue of Nature Reviews Immunology. In that article, Forsyth Institute researchers at the Harvard School of Dental Medicine called for increased efforts to develop a vaccine, deeming it a “public health imperative.” Government researchers at the National Institute of Dental and Craniofacial Research are also working on a new vaccine approach. Research is currently focusing on the most efficient way to deliver the vaccine directly to the mouth, according to the Forsyth Institue review article, a method that differs from usual vaccine injections into the bloodstream. One solution is to inject the vaccine near the major salivary glands, which happen to be in the mouth and throat and can naturally deliver the antibodies. An even more promising approach is to develop an effective nasal spray, which can also stimulate the needed immune response. The ideal population to vaccinate would be very young children. When we are born, our mouths are sterile but quickly become colonized with bacteria. Over 700 largely “good” bacteria species live in our mouths, analagous to the bacteria that inhabit the human gut. If a vaccine can be given early on before bacteria start to move in, Streptococcus mutans, and other cavity causing bacteria, might never find a home on our teeth. Since kinks in the anti-cavity vaccine have yet to be worked out, there are no FDA-approved versions on the market yet. The Forsyth Institute continues to forge ahead chasing their call-to-action: they have tested a vaccine in animals for effectiveness, as well as in humans for safety. Former Forsyth researchers are now leading a company called Oragenics, which is gearing up to obtain FDA approval for conducting major clinical trials sometime in mid-2007, in the hopes of commercializing the Institute’s research. If such a vaccine does eventually emerge, it could go a long way toward addressing health inequalities. The Surgeon General noted in 2000 that 80 percent of cavity-related problems are concentrated in just 20-25 percent of children, primarily belonging to African-American, Hispanic, Native American, and low-income families. The vaccine could theoretically help even in areas of the world where dental care is nonexistent, giving everyone something to smile about. Will this vaccine be available to adults? I had no cavities until age 32. There were 4-5 until menopause. Since menopause I have had multiple cavities per visit. I’d love the vaccine. Sorry for not responding earlier. Researchers have tested their experimental vaccines on adult patients, by first using antibiotics to clear the mouth of bacteria and allowing the vaccine to do its work. So while the primary vaccine targets will undoubtedly be children, I wouldn’t be surprised to see versions for adults. I am 47 and have been menopausal for several years. After having TWO cavities in my entire life, I just saw the dentist. I now have about 2 dozen cavities. My mouth looks like it has been totally neglected for years, which is not the case. This is not fair! is there a vaccine yet? also, do you know any antibiotics for cavities? Greetings, I remember emailing Oragenics back in 2006 and they said very little; any word on these studies or perhaps estimates of when they’ll be concluding? I ask because we are nearing 2010!